You may be forgiven for averting your eyes when coming across salsify. It's a rather ugly root vegetable, grubby-looking with all that earth clinging to the skin. But during the winter months, salsify makes a welcome change from parsnips, sprouts and cabbages. So what does it taste like? The clue might be in its nickname. Salsify (Sahl-seh-fee) is known as the oyster plant or oyster vegetable. These giant pencils are members of the dandelion family, a Mediterranean plant with a delicate taste, ever so slightly sweet, some say slightly reminiscent of oyster. Many liken it to an artichoke instead, however. Salsify is perfect on its own, but it's also a natural match with all sorts of other seasonal vegetables such as celeriac and mushrooms. The other issue besides the unsightliness, is the availability. Salsify is not easy to harvest; pulling the roots from the soil without breaking them is time consuming, making it a little hard to come by. You will probably find a bunch in the weekly organic vegetable boxes or on farmer markets stalls between October and January (and supermarkets are beginning to stock them too). 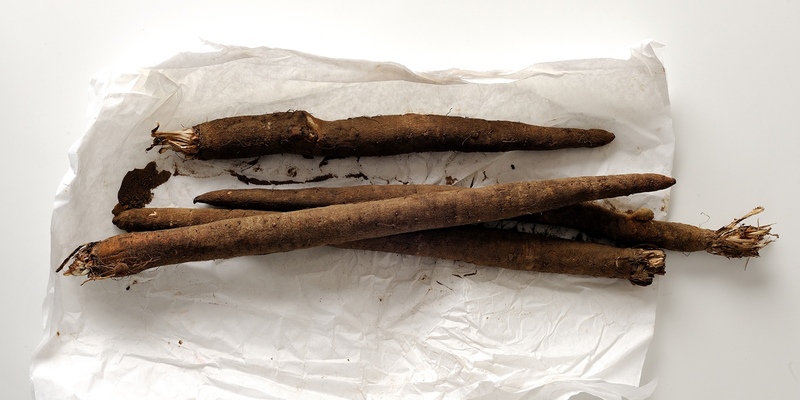 Encouragingly, salsify recipes are making a comeback on restaurant menus – after all, this winter vegetable was extremely popular with the Victorians. The good news is that it is an easy vegetable to prepare and very fast to cook. As the taste is quite mild, this vegetable should please a cross-section of people. Salsify has a mild flavour which is easily enhanced by infusing with other ingredients. Try enhancing the method above by poaching the salsify in chicken stock or white wine. Adding aromatics such as a bay leaves, thyme or black peppercorns also adds depth of flavour. Like other white-fleshed root vegetables such as parsnip or celeriac, salsify is lovely blended into a creamy soup or purée. Pollyanna Coupland’s leek and salsify gratin pairs the vegetable with a silky cheese sauce; the perfect comfort food. Salsify also roasts nicely – basting with plenty of foaming butter will intensify the naturally nutty flavour and caramelise it to an appealing golden brown colour. Serve with some crispy salty bacon for an exciting wintry side dish.